Cindy Archillies is an Eyewitness News multimedia producer based in Cape Town. Stormers fullback Craig Barry explains how his Be The Difference Foundation is helping to equip young rugby players from underprivileged backgrounds with the skills to progress on and off the field. We sat down with Hugh Everson, the physiotherapist of the SA Sevens team after he reached the milestone of being at 100 HSBC World Series tournaments last December. Unite Behind staged a demonstration at the Cape Town Station where President Cyril Ramaphosa was unveiling new train sets. Prasa has unveiled the new models that form part of its modernisation programme. Jason Windvogel, aged 17, is one of two people who died while protesting for housing and better service delivery. The Independent Police Investigative Directorate (Ipid) has confirmed the pair was shot dead during service delivery demonstrations on Thursday 4 April. 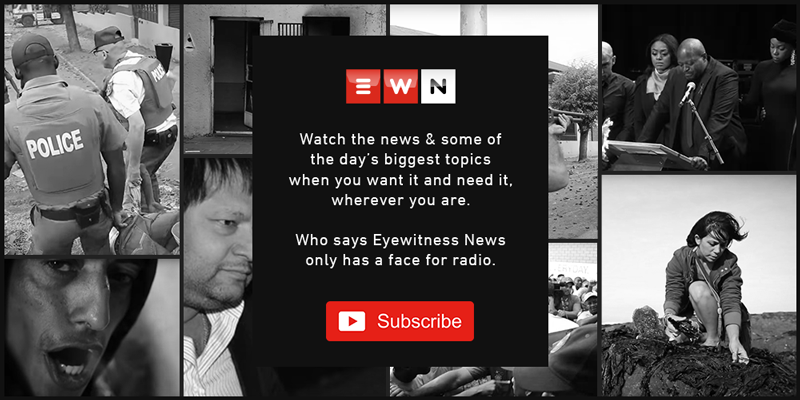 EWN sat down with former Springbok and now cyclist Joel Stransky at the Absa Cape Epic where he talked about giving back with his Vision 2020 initiative. Bergville is just one of the schools severely affected by continued targeting by petty criminals. Since the start of the year, there have been 160 burglary and vandalism incidents at schools across the province. EFF Leader, Julius Malema addressed a packed Philippi stadium as part of the party's election campaign drive. Hundreds of supporters gathered at the Philippi Stadium in Cape Town as EFF leader Julius Malema launched the party's provincial manifesto. The Cape Town International Jazz Festival celebrates its 20th birthday this year. The first night of the festival kicked off with some stellar performances. Hannele Steyn has cycled over 11,200km as she has completed every Cape Epic mountain bike race held. 'The last Lioness' completed her 16th Cape Epic this year. Highlights of the Stellenbosch Air Show included the South African Air Force Silver Falcons and a Boeing 737 airliner flypast. The Stellenbosch Air Show took place on 23 March 2019. Some of the highlights of the show are the South African Airforce Silver Falcons, a Boeing 737 airliner flypast, and a skydiver will jump with the biggest South African flag ever to fly. The hospital that saved Baby Hope's life says the one year milestone is cause for celebration. Hope had a rough start in life. With a birth weight of just 300g, she is one of the smallest micro-premature babies ever to have survived in South Africa. Today is her first birthday.